From 3,000 miles away, my son rejoiced with us when the Red Sox went ahead 3 to nothing, then moaned in agony (well, he and his father were texting in agony) when Giancarlo Stanton hit a grand slam in the fourth inning, putting the Yankees ahead, 6-4. At that point, Yankee Stadium was partying, big time, and I was trying to stick to my good sportsmanship resolutions: Root for your team, groan when things go wrong, enjoy the game. The new stadium is a far more courteous place. Don’t get me started on the monitors who block people going in to sit down with their little signs that say “For the consideration and safety of seated guests, please wait until this at-bat is complete, Thank you.” (No, they don’t do that at Fenway Park.) And actually, I realized, we were surrounded by friendly mixed groups — there were three big guys standing near us, who had clearly consumed a fair amount of beer, two in Red Sox jerseys, one in a Yankees pinstripe shirt, companionably alternating loud advice to the coaches, far away down on the field. A couple walked by, holding hands, just as Jackie Bradley Jr. tied it up at 6-6 for the Red Sox with a home run in the seventh; the man (Red Sox shirt) grinned and the woman (Yankees) rolled her eyes. The Red Sox got two more runs in the seventh, and the Red Sox fans got noisier — or, to be fair, the Yankees fans started to go home; it was a very long game. 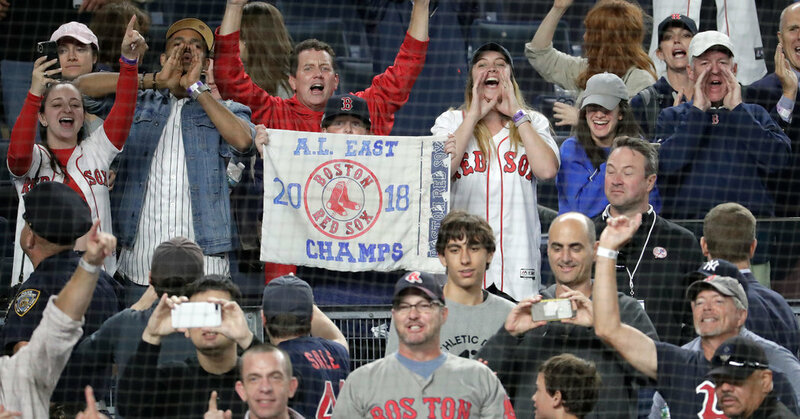 By the eighth inning, when the Sox got to the Yankees closer, Aroldis Chapman, and Mookie Betts hit a three-run homer, the balance in the stadium had tipped heavily to Red Sox fans, all busy high-fiving one another. In front of us was a father-son duo, the father (who had grown up in the Bronx) a serious Yankees fan, the son Red Sox all the way, enjoying the game together, cheering and groaning in a familial alternation that reminded me of watching my son and his friend. It was a beautiful night for a game, slugfests are fun, and it was a blast to see the Red Sox clinch. Sinatra’s version of “New York, New York” came on, and we headed for the subway. In California, our son was jubilant that we had been there, and in our haphazard parental way, we had kept our promise — he loved growing up in New York City, but the Red Sox helped him, as Frank would say, do it his way. I felt euphorically grateful to baseball, which really does teach you about patience, and about curses and statistics and the capriciousness of fate, and of course, about losing and winning.